Samoan tribal tattoos meaning is deep and interesting. In fact, as per Samoan tribal tattoos history, the art of tattooing came to this island from Fiji. When twin sisters named Tilafaega and Taema visited Fiji, they met 2 tattoo artists, who taught them the art. The sisters returned to Samoa and Taema became the first tattooist. She also taught tattooing to Samoan natives, who developed and spread the art further. That is how the Samoan tribal tattoos and their meanings became rich and unique. Samoans worship the sun chiefly because of its role as the life giver to every creature and plant. The heavenly body is also worshipped for its extreme brightness and is considered a symbol of leadership, as it is one of a kind. The sun is given facial features, just as a human being would have. It could be shown with rays or without them and both these depictions have a tribal tattoos meaning. Around the sun, the tattoo would have abstract design and it could be as large as you want, enough to cover the entire back area. In the Samoan language, sea turtle is called I’a sa, which means sacred fish. Apart from their high longevity, turtles are known for their navigation skills. That is why Samoan fishermen would have turtle tattoos so that in case of going lost in the sea, the turtle tattoo would help them navigate the waters and come back home. Turtles are also symbols of strength. The shell of a turtle is used for a variety of purposes starting from needles, tattoo combs, fishing equipment like hooks to jewelry like necklaces and bracelets. This is the reason that Samoan warriors always had sea turtle tattoos on their arms, chests, and backs. Not much is known about its importance but it is one of the cool tribal tattoos. This elongated tattoo is made right in the center the of back where your spinal cord is and has an intricate design. It runs all through the length of the spinal cord starting from the neck to the tailbone. The pattern is continuous, which ends with an elegant Samoan motif. 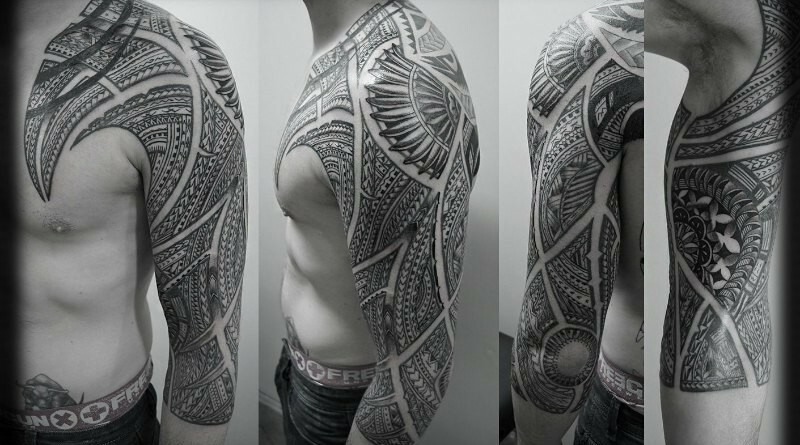 Although the tattoo looks impressive in itself, you could ask the tattooist to add other Samoan motifs on the sides. This tattoo is your best bet if you want to keep the art hidden at all times. This tattoo simply looks extremely impressive on a well-built shoulder. The design includes spirals, which symbolize ocean waves. The spirals create an optical illusion, which makes the shoulder look even more muscular. For Samoans, the ocean is a powerful natural element where the dead are believed to reside. These cool tribal tattoos are made to honor the dead and show respect for the mighty ocean. As most Samoan men are engaged in occupations related to the ocean, all of them can be seen sporting wonderful shoulder blade tattoos. For those, who love Samoan tattoos but cannot go through the pain of having their entire back tattooed, they could choose to have the full sleeve tattoo. As the tattooist gets a large area to ink, you could ask him/her to incorporate a variety of elements like sea turtle, Samoan flowers, dolphins, sea waves, etc. in the tattoo design. The tattoo could have lines all over or be full of opaque designs. Of course, if you choose to have lines then there will be less pain compared to opaque designs where the tattooist would fill in black color with the needle.